Villem Ormisson was one of the most outstanding colourists in the history of Estonian art, according to experts. Unfortunately only a very small portion of his body of creative work has survived and for this reason, every painting of his is an event. Ormisson came from Viljandi and as a rule, he worked in the so called classical genres, depicting landscapes, still-lifes or scenes of working class districts, and sometimes also painting portraits. A bright and optimistic overall colouring and several mysterious details, the meaning of which is impossible to unequivocally determine, are characteristic of his works. Ormisson was extremely receptive to impulses from nature. As a passionate fisherman and hunter, he was very familiar with nature. Unfortunately, his journey through life was cut short since political tensions led him to commit suicide. Villem Ormisson’s painting was evidently completed in Southern Estonia, yet its title is astonishing. We see a view that abounds in green, where trees and fields express the vitality of summer instead of the melancholy of autumn. The artist’s distinctive technique, where he makes dots with the tip of the paintbrush, gives the painting a frizzy and airy overall appearance. Unlike his teacher Konrad Mägi, Ormisson has left little room for direct improvisation and has carefully constructed the entire painting. 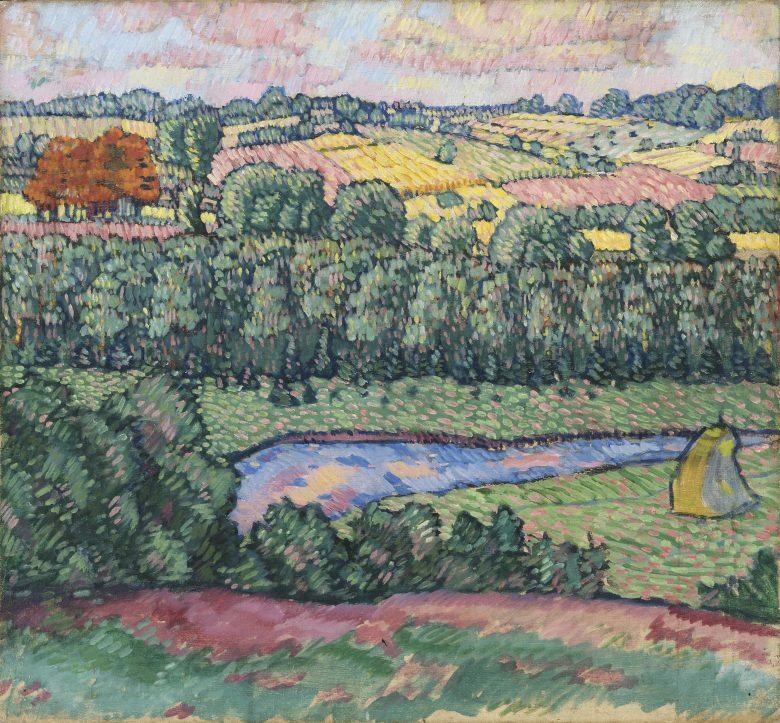 The foreground, in the creation of which Ormisson’s hand has moved more freely, and the small brown group of trees in the rear on the left, which is the only truly autumn-like part of the scene, emerge as the only exceptional surfaces. This contradiction between the grove of trees and the rest of the painting is fascinating and creates an ambivalent impression. Villem Ormisson often worked with large-format paintings. The still-life is ordinarily considered a relatively intimate motif, but Ormisson expanded it into a spectacle of colour. The still-life is also a point where nature meets culture: on the one hand, we see living nature, yet on the other hand, it is a little bit of nature placed in an anthropogenic environment. 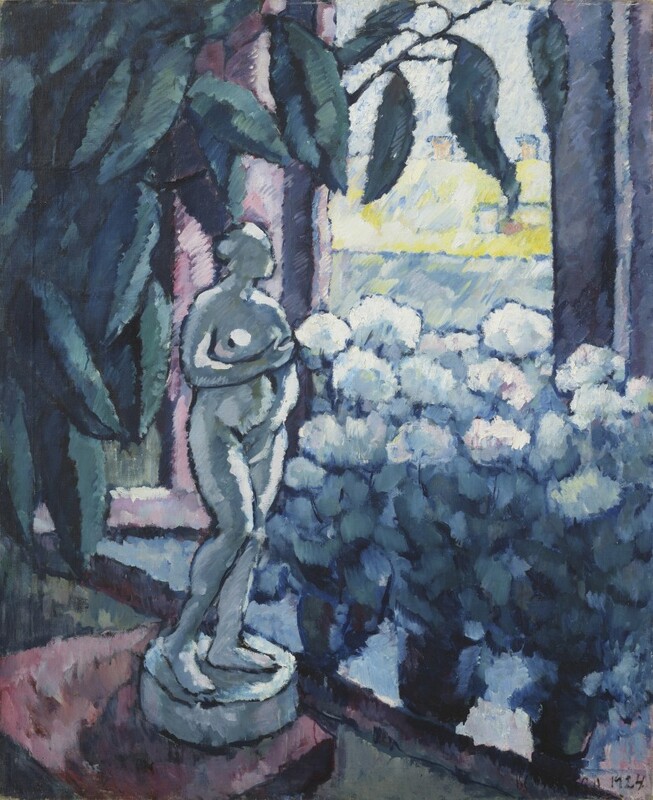 Thus Ormisson also combines nature and culture in this painting, bringing a marble sculpture into the foreground of the work. 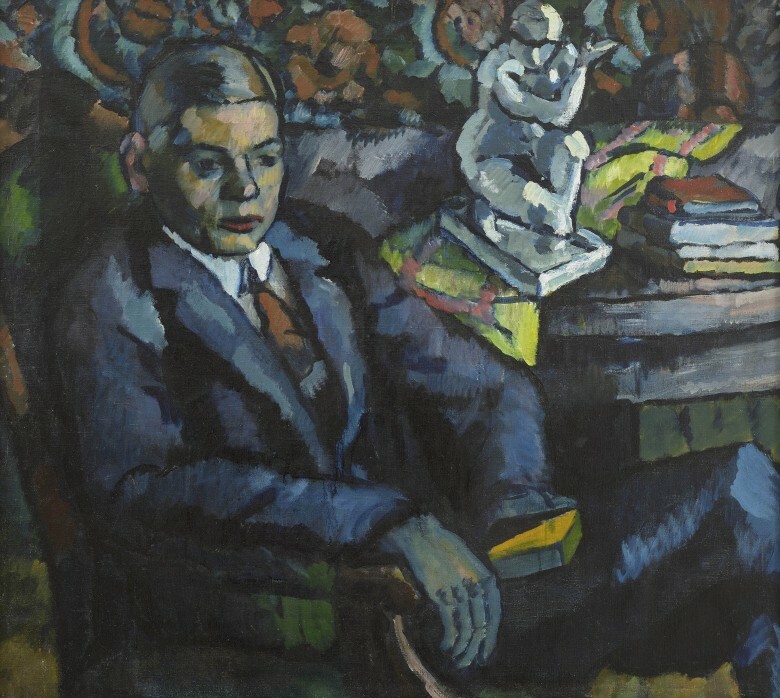 This kind of sculpture can be found in several of Ormisson’s paintings (with the model admittedly in a different kind of pose): sometimes in the foreground, sometimes in the background. It is possible that for Ormisson, sculpture was one possibility for how to examine the depiction of plastic bodily forms or for introducing an unexpected patch of colour. This work is one of the largest known works by Ormisson. Incidentally, the brightness of the colours in Ormisson’s paintings is explained by the fact that his studio was dim. For this reason, he had to choose the kinds of tones that would have an effect in dim light as well. Villem Ormisson was known first and foremost as a painter of landscapes and still-lifes. Portraits form a smaller but extremely interesting chapter of his creative heritage. Karl Ormisson was Villem Ormisson’s younger brother, an enfant terrible whom Villem painted on several occasions. Only this work has survived and it is considered to be Ormisson’s best portrait. Karl Ormisson was very talented but unstable by nature. He had volunteered to fight in the Estonian War of Independence at the age of 17. Later, however, he switched his subject fields as well as universities as he continued his education, also studying in different countries on top of everything else. His living expenses and tuition fees finally reduced the hotel of the Ormissons’ parents in Viljandi to bankruptcy. Karl Ormisson married later and moved to Germany. Relations between the brothers had been reserved. Regardless of this, the artist had decided to paint him.